Do you dream of a wedding in a setting that is both beautiful and deluxe? About a holiday that goes above and beyond in sumptuous surroundings. 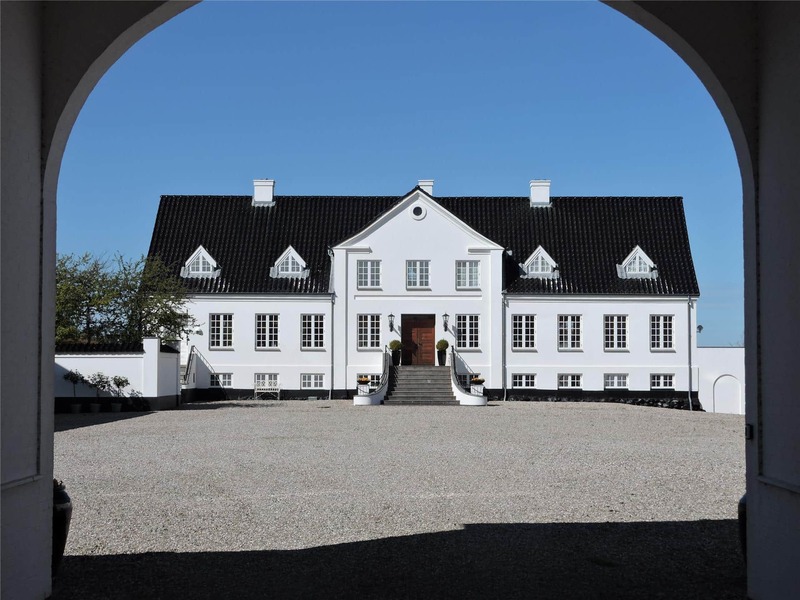 If so, the elegant Edelsminde on South Funen is the most beautiful place to make your (luxury) dreams come true. This charming property has been renovated through and through, from top to bottom, inside out - and nothing has been left to chance in this tasteful, exquisitely designed décor. This also applies to the many rooms, where you can accommodate the guests you have invited to share your dream. At Edelsminde you can rent the entire property with all its premises if it is your greatest and most exclusive dream. Here you will find many square metres, miscellaneous locations and overnight accommodations. At the same time, the letting of Edelsminde is so flexible that you can rent parts of the property separately for smaller events. Please note that if you want to rent the entire Edelsminde for your event, you have to be one step ahead and book several years in advance. When it comes to the smaller units on the property, you can usually rent these three months before the date on which you want to use them. A beautiful, deluxe room, which meets even the most exclusive of dreams of a party that would leave all participants with a memory for a lifetime! In the banquet hall you can welcome as many as 149 people, all of whom should be ready for a WOW experience. For parties, the banquet hall can be set with round tables and additional tables as needed. For example, there can be gift tables or buffet tables. It is the scenographer of Korsbæk på Bakken who has decorated the premises. You can tell by the décor, which looks extremely elegant. Step into a room that provides a very personal setting for your big day. The banquet hall also includes a professional industrial kitchen where catered food can be arranged and made ready for serving, or where professional chefs can prepare the star menu you have chosen to serve your guests at Edelsminde. Needless to say, the main house at Edelsminde provides an exceptional experience using unique facilities for parties, meetings, small conferences, board meetings etc. The main house offers access to both an elegant dining area and a living room which makes it an inspiring meeting place when you need a little more intimate and extremely invigorating setting. The main house can accommodate 22 people overnight. You can also rent another accommodation at Edelsminde. For example, the flats that belong to the main house and have room for a total of 16 people. When you rent the whole or part of Edelsminde, you and your guests get to use not only the manor facilities. Edelsminde is located in an action-packed area of the beautiful South Funen where you can enjoy nature, adventures and activities right on your doorstep. The local club Skovhuggeren (The Logger) on South Funen has built one of Denmark's biggest and finest MTB facilities in Egebjerg Bakker. This facility, with marked-out tracks and trail, is located close to Edelsminde on Hvidkilde Gods soil. 12 km of single tracks have already been built in forest and timber shoot overlooking the South Funen Archipelago, and when the facility is complete, there will be 7 more km of MTB trail with challenges on all levels and with fine technical elements. At the same time, it is easy to buy access and passes for the facility. Many hours of sunshine are not guaranteed but who needs sun when the mountain bike track is the right one. Svendborg Golf Club’s coarse is located in Sørup, right next to Edelsminde. It is an 18-hole golf course in the hilly landscape typical for South Funen. The course has some high spots for the advanced golf players with low handicap and a liking for challenges as well as for the less experienced players who enjoy the combination of beautiful nature, good company and plenty of good golf. The highest points of the course offer fantastic views over the South Funen Archipelago, among other things with Ærø on the horizon. There are water hazards on the greens at many holes, there are challenges for both your long and your short game, and there is putting on greens which, according to the club itself, is among the fastest in Denmark. The club also has a nice and exciting 9-hole course for a bit faster rounds, or for golfers who enjoy challenging play on 27 holes. In the vicinity of Edelsminde lots of adventures await on all sides – and there is something for every taste very close by for overnight party guests with time to bring some extra experiences back home, for the large family that meets for a cosy (and active) mini break for all generations and for those who set out to explore South Funen. Whether in charming Svendborg, the South Funen Archipelago or the incredibly picturesque forest landscape with archipelago trail and marked-out route, surrounding both Hvidkilde Gods and Edelsminde, there are plenty of adventures close by within both walking and driving distance. From golf to mountain biking, from Gorilla Park to angling.